“he is quite an icon. 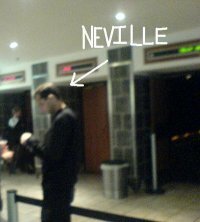 If you have been to the movies at Cavendish, you’ll always see him walking around, looking busy and taking your tickets. go post your sightings of him. and don’t forget Tall Blonde Guy (TBG) from 2oceansvibe and Token Black Guy (TBG) from Shaun Oakes. like, the guys at wklondon said, this video of Pete Doherty shooting heroine probably isn’t what McD’s had in mind when the signed up to sponsor the viral video of the day. found on The Sun’s homepage by these folk. “Aida and Gwen feel unwanted and scared in South Africa. They’ve considered leaving, but Europe is very cold and they only have South African passports. After a divine visitation from their ancestors, Cecil John Rhodes and Queen Victoria, they are encouraged to mobilise ‘their people’ towards the formation of ‘EurAfrica’. It’s a haven for all those English liberals in South Africa who want a place to call home. let it be known that my stomach still hurts. it’s exceptionally witty and extremely relevant. highlights include… oh go see for yourself. it’s at Obz Cafe every Sunday night until 2 December. starts at 8.30, it’s best to go around 7.30 and have a drink, maybe something to eat before the show. tickets are R49, and i recommend you book a table as there wasn’t any free space that i could see. Click here for their offical website. if you’re a brand speaking to youth white south africans between the ages of 18 – 28, here’s some content you might want to get involved in. suggestions include sponsorship, exclusively promoting trial and sampling of your brand during the performance (atmosphere is very condusive to it), merchandising, even turning it into a television special. kinds of brands it would suit: edgy, say it like it is brands, fashion, alcohol – great for experiential, strong retail partner.